Quality Pool Chlorinators at the best price in Australia! 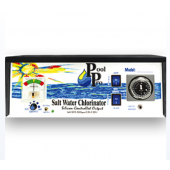 A salt water pool chlorinator makes owning a clean pool easy! Salt chlorination uses an electrolysis process to produce chlorine from common salt (sodium chloride) which has been added to the pool or spa water in a measured amount. The chlorine gas produced by this process is soluble in water, and so dissolves instantly to form Hypochlorous Acid which is the sanitiser used to sterilise the pool or spa water. Salt chlorination is the most popular form of pool sanitation today. Because salt chlorinators are designed to create chlorine in your pool water, you no longer have to add it manually, leaving you with more time to enjoy your pool! When the system is also automated, you can be sure the chlorine needs are matched to the pool needs and that the pH levels are kept in balance as well. At Pool Supermarket, we stock a range of the most popular Salt Water Pool Chlorinators at the best price in Australia! If you are not sure which product best suits your set-up, contact us! Our friendly team is always happy to assist you in making the right choice. The price of this item is not available online.Please contact us for details.